Setting up an in-house IT department can end up being a lot more expensive than you might think. This is because you'll need to hire specialized staff to run your IT department. It's not just a matter of adding a few extra salaries to the payroll either - with new staff comes the need to pay for training, management oversight, employment taxes, health insurance and retirement plans. With IT outsourcing, you won't be responsible for hiring an IT staff. Instead, you'll just pay for the monthly IT service fee, which will end up costing you less in the long run. Not to mention that IT providers often receive discounts for purchasing hardware and software in bulk that can be passed on to you. IT problems are always going to pop up, whether you outsource your IT department or you maintain an IT department in-house. The big difference is that when you outsource to an IT provider, they will have staff monitoring your IT at all times - 24 hours a day, seven days a week. This allows them to spot potential issues before they cause serious problems and before they result in substantial downtime. Most small or mid-sized businesses don't have the resources to monitor their IT at all times, which means if problems pop up that aren't spotted right away, they can end up causing serious disruptions to your day-to-day business. Additionally, an IT provider will be able to solve many of your IT issues remotely. An IT provider will be staffed with experienced and knowledgeable individuals who stay up to date on all the latest IT solutions. They will be able to provide you with professional advice concerning your company's IT infrastructure so that you don't end up wasting resources on hardware and software that you may not need. An IT provider will customize IT solutions based on your company's unique needs. Hiring IT staff and training them requires the use of resources that can be put to better use. By outsourcing your IT department, you can use those resources to focus on your core competencies, thereby giving you the ability to focus on growth and on achieving strategic business goals. Businesses that have in-house IT departments know that the costs of maintaining their IT department fluctuate from month to month. This can make it difficult to budget, which can be problematic if you have limited resources to begin with. An IT provider will charge a flat monthly rate, making it much easier to plan around a set budget. 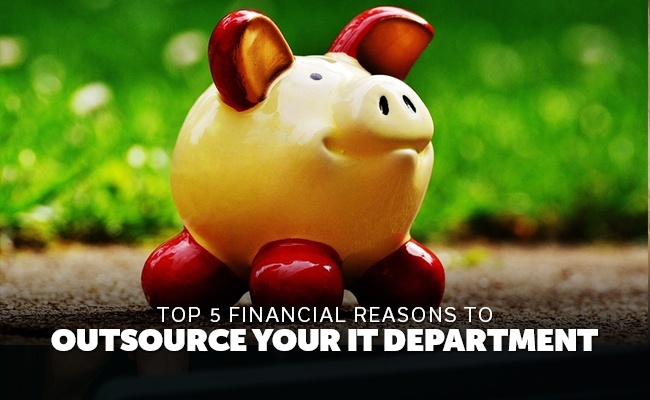 These are five of the main ways that you can save money via IT outsourcing. However, there are many other benefits to outsourcing your IT department besides just saving money that you should consider as well. For more information about IT outsourcing, be sure to contact us at Envision IT Solutions today.